Try one of Ibiza Watersports’ excellent packages, where you’ll get to see the pretty western coast of Ibiza, taking in beautiful beaches, secret coves, caves and much much more. 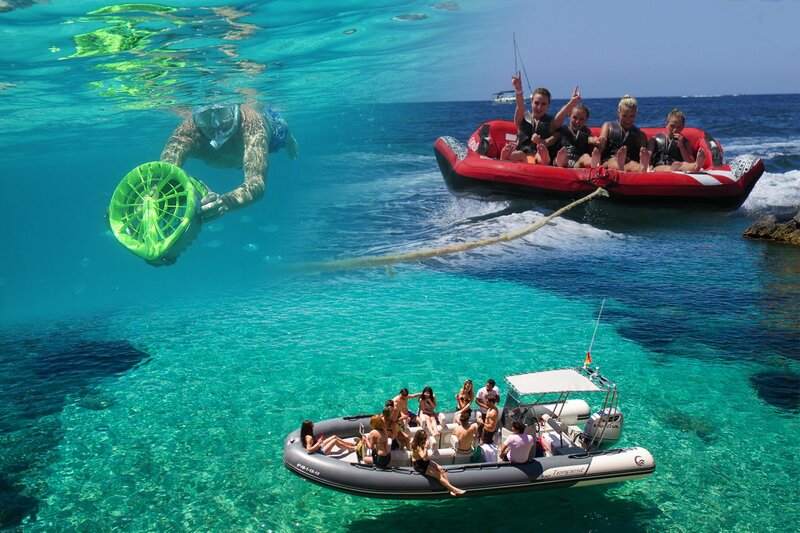 Ibiza Watersports offers complete adventure packs so you can try a bit of everything in one voyage. Sweep past beautiful coastline and stop to swim, snorkel or watch one of the incredible sunsets in San Antonio Bay. Choose from one of the packs below to see what suits you and if you want to do more than one, you can do them on different days. Twice or three times the fun! Speedboat sunset trip and inflatables. A beautiful 1.45-hour excursion taking in Cala Gracio, Cala Gracioneta, Cala Salada and Cala Saladeta. You will see some spectacular rock formations and caves, dramatic cliffs and the villas of the very wealthy. On this trip you get a 40-minute stop in front of the famous bars on San Antonio's Sunset Strip to enjoy one of the world's finest sunsets with a glass of champagne in hand. You also get 2 free inflatables of your choice to play about on in the water. Enjoy free drinks and good music on board. This trip is perfect for exploring Ibiza's coastline. You will be able to see dramatic scenery, cliffs, caves and usually inaccessible islands. See the fine residences of Ibiza's elite and get some of the best views of incredible beaches like Cala Bassa and Cala Conta. You have a 40-minute stop for swimming and snorkelling, with all the equipment provided. You'll stop in front of the famous bars on San Antonio's Sunset Strip to enjoy one of the world's finest sunsets with a glass of champagne in hand. There's also the Bladefish sea jet, free drinks and on board music to add to the mix. Departure point: on S'Estanyol beach - San Antonio Bay. Opening hours: from April 15 to end of October, every day from 10:00 to 20:00. Activity time: Day trips every day at 15:00 and 17:00. Sunset trips every day at 19:00. Other times available on request. Requirements: swim gear, sun cream, towel, a jacket or cardigan. Price includes: snorkel gear, free drinks and good music on board, life jacket, insurance. Sunset trips moreover include a glass of champagne. Languages spoken: Spanish, English, German and French. Cancellation policy: If you cancel more than than 24 hours in advance of your chosen date, you will be fully refunded. It was definitely more than I expected. From the inflatables which was an incredible adrenaline rush and very fun, to the sunset boat ride where we were able to see various popular points in Ibiza with a lot of interesting stories, the caves were very amazing and we truly captured the beauty of them as described on the website, we were able to snorkel and see the fish around us which was very fun! It was a truly magical moment when we went to Cafe Mambo to watch the sunset since as soon as the sun set everybody clapped and their was this sense of wholeness. The boat driver and host was very fun, friendly and sociable with everyone on the boat which made the experience much better!